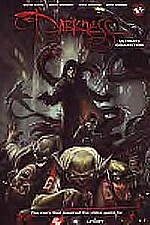 Darkness: Ultimate Collection/346 pages and $19.95 from Top Cow Comics/various artists and writers/ sold at comics shops and at www.topcow.com. These are a few of my least favorite things: buckets of gore, extreme violence, profanity, promiscuity, visual and prose clichés, a ‘hero’ who is vile, an entire cast (except a one dimensional barkeep) that is vile, unrealistic dialog, nihilism, and a protagonist who transforms into a superhero costume for no discernable reason. All of that and more are found in the first half of Darkness: Ultimate Collection, which reprints early issues from The Darkness comic book series. My greatest struggle was in finding a reason to read the rest of this anthology. What a mess. I did it so that you, dear reader, won’t have to do it (unless my least favorite things are your favorites). For the still curious, the premise of this series is that certain people throughout history are chosen to carry “The Darkness”, or, more accurately, control a horde of demons they release from Hell. And what better host than a hit-man for the Mob? Lo and behold, I am semi-glad I read the second half of Darkness. The second half of this odd mix of Mafia with supernatural demons moderated the gore, violence, profanity, clichés, and unrealistic dialog. It is better written, the characters actually have personalities, and the plot thickened beyond slaughter. This successful series has even generated a video game from a company who gushed over my list of least favorite things. So why is this distasteful series so popular if you, Mr. Know-It-All, don’t like it? The art is terrific throughout, and some folks like to watch train wrecks.